Made from a combination of American hardwood and durable polymers, our Composite Shutters are made to retain their shape, color, and appearance. Our shutter tilt bar features a "no mouse hole" design. This allows each louver to close tighter in both directions. Made with a patented, spring-loaded design to minimize light gaps on the side of each louver for added privacy and light control. Made in USA. 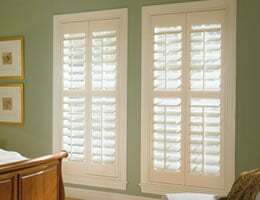 Each plantation shutter is fabricated within 15 business days. Not the typical 6 to 8 weeks delivery for shutters. This was my first time experience installing shutters. This was my first time experience installing shutters. I was bit nervous with measurements and order. I followed exact instructions provided on this site and placed order. The product was not shipped for a while and I have to chat with one of reps. He promised me to check next day as supplier was closed for the day. The order was shipped next day and I received it. I was still nervous before I start install. I printed install instructions and followed guidelines. Pretty simple though. Only part confused me was magnetic hinges (felt it should be more simple and with full pictures)! I setup whole unit without any screws on window to make sure that. it all fits. If they show the real pictures of product instead of diagrams , it would be easier to follow instructions or some kind of video on you tube. Beautiful shutters. Great finish and easy installation. Purchased 2 sets of shutters.........didn't take long and they were delivered. Purchased 2 sets of shutters.........didn't take long and they were delivered. My husband put them up in less than an hour.....WA..LA!!!!! Looks beautiful!! I received my indoor shutters in a very timely manner. I received my indoor shutters in a very timely manner. They were easy to install and they look fabulous! I would recommend your company to everyone! I had priced indoor shutters at other places. Blinds Chalet was HALF the price of other companies! From Blinds Chalet you get high quality products, quick service, and fantastic prices! The type of shutter frame is somewhat determined by the window. Hanging Strip For windows with at least 2.5" of depth with inside mount. Z-Frame/Trim Frame For inside mount shutters with at least 2.5" of depth. L-Frame For outside mount shutters with or without molding. May be mounted on top of existing molding. Frame size = 1 5/8"
Face Mount For outside mount shutters with or without molding. May be mounted on top of existing molding. Frame size = 2 1/4"
The number of sides of the shutter frame. 4 sides are standard but for instance if your window has an extruding window sill 3 sides is recommended. Determined by the width of your window, the number of shutter panels within the shutter frame. You can adjust this number to customize your shutter design, look, and feel. When more than one panel is selected they will be equal size. How each panel attaches to the frame and the other shutter panels. Shutter configurations are when looking at the shutter from inside the house and are listed from left to right. Divider rails are used to add strength and stiffen the shutter panels. Shutter panels over 60 inches in height will require a divider rail. Divider rails allow the top and bottom portions of the panel to be tilted open and close independently but do not allow the top and bottom sections to swing open separately. The measurement for the divider rail position is from the bottom of the shutter panel to the center of the divider rail. Color of the hinges used to open and close each shutter panel. Louvers are the horizontal slats on each shutter panel. Louvers are available in various sizes measured by the vertical dimension of the louver.